In 1941, Joe DiMaggio hit safely in 56 consecutive games, a record that still stands today. This card highlights his ninth game in a row with a hit during his record-setting stretch. The red hot Derek Jeter just lost an eight game hitting streak on Saturday, so DiMaggio’s record will remain untouchable for now. DiMaggio is always in the conversation of the best Yankee of all-time, right next to Babe Ruth, Lou Gehrig and Mickey Mantle. Unfortunately, all four are only legends now and are no longer living. 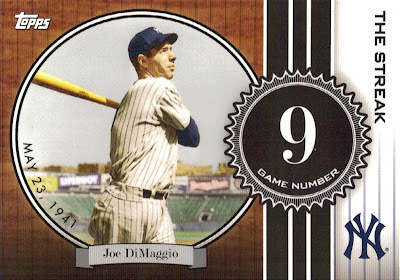 Topps released a Joe DiMaggio collection in 2007 to help commemorate his legacy. There is a card for each one of his 56 historic games. The Yankee Clipper’s No. 5 is retired for the Yankees franchise.